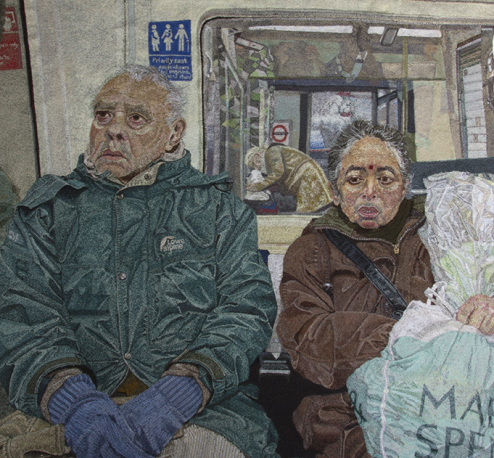 After over two years of stitching, I am now in the final stages of preparations to get my drawing ‘A Couple on the Tube’ exhibited at Chelsea College of Art, London. On 12 July the Society of Designer Craftsmen’s exhibition ‘The Hand of the Maker’ opens and runs for nine days to celebrate 130 years of the society. My large free machine embroidered drawing has been collected by courier and transported to London ready for the hang. Before that, my work was in the care of some very skilled professionals: David Gould photographed the drawing before it was attached to a sheet of Perspex® and then Edge 2 Edge in Staple Hill, Bristol, framed it. This is a very difficult job because the frame contains museum grade glass and both this material and the Perspex® collect any fibre of fluff that happens to be in close proximity. I am really excited about the exhibition because there will be two firsts: it is my first time to exhibit with the Society of Designer Craftsmen and the first time that ‘A Couple on the Tube’ will be exhibited. I do hope you will get time to visit. For further information about the exhibition, please visit the Society of Designer Craftsmen website. The exhibition runs 12-20 July and admission is free.